This villa project is built in the northern side of Alanya, knows as the popular villa territory Bektas where more villa projects already are finished or which are still under construction. At this moment there are 14 detached villas, each on his own plot of 400 M2 and with a living area of 240 M2. 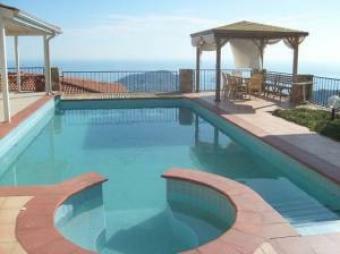 Each villa has his own private garage and swimming pool ( 40 M2 ). Trough there location enjoy each villa of a gorgeous panorama to the Mediterranean ocean, Alanya castle and the growing city of Alanya. The complex lies 450 m above the sera level and it take max. 15 minutes car drive to town or to the beach. On the first floor we have 3 bedrooms. The master bedroom has his own ensuite bathroom and a dressing room. The other 2 bedrooms and a communal bathroom you can reach from the corridor. There is a basement witch is split into 4 rooms, these can be used for a sauna, a steam room or a hobby room. Some villa have their own private garage with space for 2 cars.